Computer science is a trending topic, and is a topic that a lot of teachers are being asked to teach in elementary schools these days. More STEM Labs, Makerspaces, robotics clubs, and technology classes are in our schools than ever before. The reality is that the current model is not simple enough for all learners to succeed. There needs to be a level of understanding (about coding) before students can successfully program a robot or build an algorithm for a block coding program. This is where Guided Coding Stories comes to the rescue! My technology teacher friend, Brittany, and I developed a way to build those foundational computer science concepts in a way that can be done with any learner, at any age level. WHY CODE IN SPECIAL ED? Before we get into the meat and potatoes of coding, I want to talk to you about WHY you should be coding in your special education classroom. 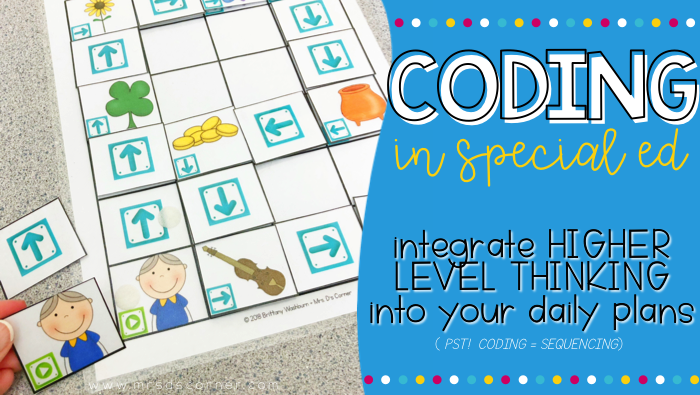 Guided Coding Stories are your way to integrate higher level thinking activities into your daily language arts special education curriculum, that purposefully and fuctionally aligns with multiple sets of learning standards. Coding with students is really just sequencing. The vocabulary is a little different, but that is because we are using math and computer science terms instead of language terms. For example, a coding sequence when put together, creates an algorithm that the computer understands as a program. In real life, a sequence is a set of instructions or steps that WE (instead of a computer) understand. Basically, we are asking our students to be computational thinkers – to think like a computer. Just like with the sequence of a story, if any of the steps are missing, the story is incomplete. With coding, once the program is run, (the programmer presses start) the computer will go through the whole sequence (algorithm) without stopping. If there is a mistake (bug) in the algorithm, the end result will be incorrect. If a story sequence is missing one of the steps, then the end can’t happen the way it was meant to happen. So simply put, it’s like a self check for sequencing. Here is where Guided Coding Stories SHINES! You’re scared. The word “coding” gives you the heeby-jeebies. You “don’t have time” in your current curriculum. You don’t know where to start with coding or STEM. And there aren’t any resources that are differentiated enough for ALL of your students. But I’m here to tell you a little, well really BIG, secret. All of your concerns are 100% warranted and I get it, but I’m throwing them out the window. With 3 levels of differentiation provided (you just print and teach) and a teaching guide to help YOU and your students, you can use this resource with any of your students, at any age… so any child you think would benefit from coding, the game is changed and it’s here for you. But let’s be honest… since coding is just like sequencing, ALL of your students will benefit. We guide you through all of the levels from errorless to higher level coding without ever needing to access a device. Students learn computer science vocabulary and concepts while playing, and there really is no way for you to mess up the teaching of it. No worries! Brittany and I planned everything out for you. E.V.E.R.Y.T.H.I.N.G. The Teacher Guide walks you through your own foundational understanding of what coding actually is. There are examples throughout so you can feel confident knowing you’re doing it right (but, again, there’s really no way to mess it up). I highly recommend playing a game called Lightbot if you want to take your coding knowledge to the next level. There is an iOS app, or you can play it on ABCYa. A great intro video for your students (and you) is called Algorithm Al on YouTube. It is a simple, but catchy animated video song perfect for your young learners. WHAT IF I TEACH REGULAR ED OR RESOURCE? We are so glad you asked… and you absolutely can use Guided Coding Stories in those classroom settings as well. Level 2 and Level 3 of any Guided Coding Story is going to challenge the learner, regardless of academic and ability level. The activities ask students to problem solve. And in special ed, all of my students are working on goals that pertain (in one way or another) to solving a problem. I would bet money that your classroom looks similar… whether it’s special ed, regular ed, or homeschool. We are constantly asking our students to be problem solvers. We provide you with one answer key, but you can challenge students to make their own custom story grids at any time. Since students have the option of making their own story grid, the challenge in endless. Have the materials ready. It’s print and prep, so really… just print it out. Read the book to your class. This can be done in a small group, whole group, or 1:1 setting. Model how to work through the Story Grid the first time. I recommend using Level 1 or Level 2. From there, everything is set up for the students to follow through to completion. You probably already have these amazing sequencing books in your classroom library (everyone loves the little Old Lady that we started with), so let’s take them to the next level with these post-reading activities! It is a sequencing lesson and a computer science lesson all in one, so the lesson meets several standards across your curriculum. So, what are you waiting for?! Print and teach, or print and prep these engaging activities so that you can further technology education for this generation. It is hard to think of a job that doesn’t require memorizing a sequence or algorithm. (HELLO task analysis for brushing your teeth or making a hamburger). Starting this skill at a young age and helping students to generalize it will help your students become valuable members of society as they get older. What questions do you still have for us about Coding in Special Ed? Post co-written with Brittany Washburn. She is an elementary educator obsessed with technology and passionate about teaching students 21st century skills. This is brilliant! Thank you. I am going to purchase this and use it in my project based SDC.